At Lord’s in St. David’s, the PHC Zebras came from behind to defeat the Boulevard Blazers 8 – 2. Clay Darrell gave the Boulevard Blazers the lead in the 7th minute, Cecoy Robinson would draw the PHC Zebras level at 1 – 1 in the 19th minute converting from the penalty spot. Robinson would put the PHC Zebras in front in the 44th minute when he scored a right footed shot to make the half time score 2 – 1. Tre Ming would extend he PHC Zebras lead to 3 – 1 in the 47th minute before Kushae Hypolite made it 4 – 1 two minutes later. Ming would make it 5 – 1 with his second goal of the game in the 63rd minute, before Robinson would complete his hat-trick with a strike in the 78th minute. Dunn-Ya Taylor would pull a goal back for the Boulevard Blazers in the 88th minute to make it 6 – 2, before Robinson scored his fourth of the game in the 89th minute and then Zakiyah Lee scored in stoppage time to earn the PHC Zebras the 8 – 2 win. At Lord’s in St. David’s, First Division League Leaders Southampton Rangers edged St. David’s 2 – 1 on a slippery surface. 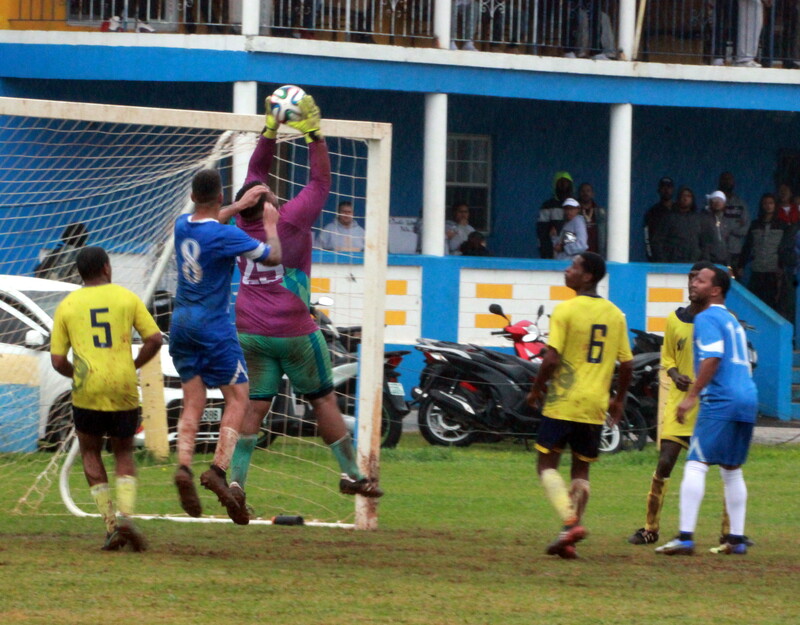 With steady rain coming down for most of the match, the Southampton Rangers took the lead in the 41st minute when Khimo Harrison scored in the 41st minute, but the score was level on the stroke of half time when Kurtis Minors scored from the penalty spot. Quadir Maynard would score the winner for the Southampton Rangers with a goal in the 85th minute. This match was called off by the field operator who deemed the playing surface was waterlogged and not marked for play. At Malabar, Somerset Eagles would defeat Ireland Rangers 12 – 0, Leo Burgess would lead the charge with six goals, while Ethan Fubler found the back of the net 4 times, Tahj Wade and Jerziah Dill added a goal each. At the Garrison Field, Wolves defeated Vasco 3 – 1. Wolves would get single strikes from Steven Almeida, Vincent Minors and Tyree Robinson, while Ricardo Ponte would score the lone strike for Vasco. At the Wellington Oval the St. George’s Colts and Hamilton Parish would finish deadlocked at 1 - 1, Vernon Lambe scored for Hamilton Parish in the 39th, Lambe would force the ball over the line from a free kick. Tre McCallan equalized for eh St. George’s Colts with a long range shot in the 77th minute to make it 1 - 1.